They make up something else, he claims – “polls”. He says polls showing he would not win might have put off some of his voters from voting – a critique shared by critics of polls who think they are flawed but do not suggest they are made up. He says he would have come last year “but I was worried that at the time I was too controversial”. He lists a number of his policies that contributed to that and the crowd cheers them. “The media didn’t think we would win,” Trump says. “Fake news!” cries someone in the crowd. The consultants didn’t either, he says. They are no good at politics “but they’re really good at sucking up people’s money”. But, Trump says, “never underestimate the people”. “I want yu all to know that we are fihgting the fake news. It’s fake, phony, fake. A few days ago I called the fake news the enemy of the people and they are … Because they have no sources. They just make them up where there are none,” he claims. He talks about a recent story citing nine sources. “There were no nine people … because I know them,” he claims. He says: “I’m against the people who make up stories and make up sources. They shouldn’t be allowed to use sources unless they use somebody’s name,” he says – a restriction on free speech he has not suggested before. “You will see stories dry up like you have never seen before,” he predicts. He says yesterday’s Reuters report was by an “honourable” journalist, however. Trump arrives to Proud to be an American. He thanks Matt Schlapp and “his very incredible wife – and boss”. 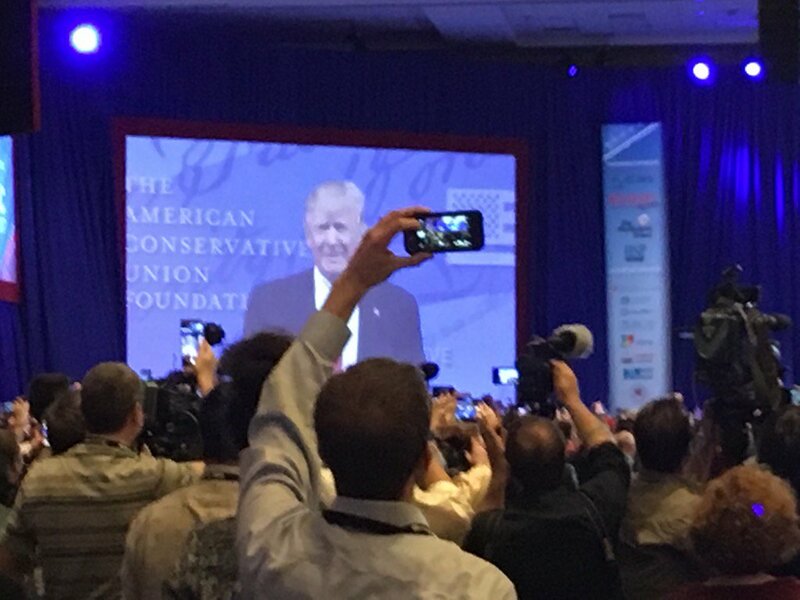 He says he loves CPAC and will “make sure that we’re here a lot”. That gets applause and a chant of USA! USA! Mercedes Schlapp of the Washington Times and Matt Schlapp, chairman of the American Conservative Union which organises CPAC, arrive to introduce Trump. The couple greet each other as “Mr Deplorable” and “Mrs Irredeemable”. Matt Schlapp says it feels good to have someone lead the US “who knows how to fight – and he’s fighting for you”. He says the conference will continue to have Trump’s back. The hall has filled up in anticipation of Trump and the attendees have been told that if they leave now they won’t be able to get back in. A brief chant of “Trump! Trump! Trump!” just broke out in an overflow area behind the media section. You can watch his speech live above if you refresh the page.